The reports continue to mount, outlining what scientists around the world define as the dire, life-threatening effects of climate change. But in Canada, the federal government is engaged in a political battle with several provinces who fear the costs of the national plan are detrimental to their economic interests and are reluctant to join the national effort to reduce GHG, opting, they say, for more local, provincial plans. Fortunately, there are significant organizations in Canada who believe that reducing GHG (and the federally-proposed carbon tax) is not only good science, but good economics as well. From its Squamish, B.C. facility, Carbon Engineering Ltd. is conducting some of the most advanced research in clean energy anywhere in the world. Over the past nine years, the company has moved forward with studies to remove CO2 from the atmosphere, in a closed loop, where the only major inputs are water and energy, and the results are a stream of pure compressed CO2. 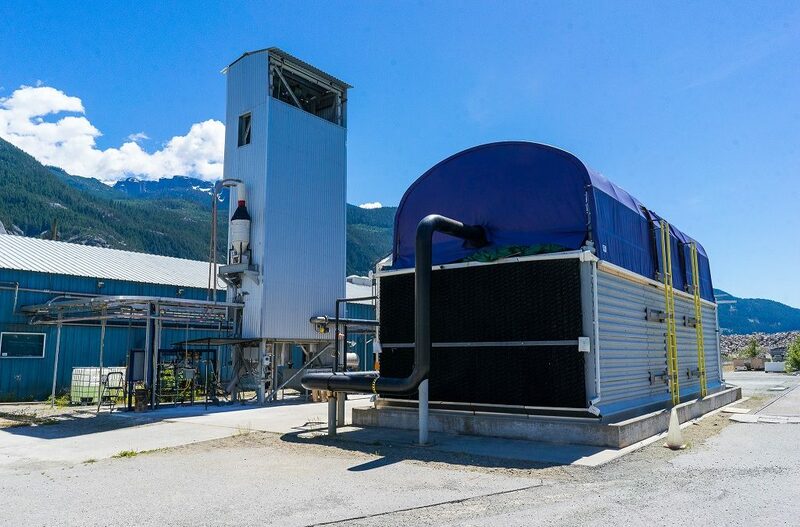 “You can make fuel from air, and it sounds too good to be true,” says Geoffrey Holmes, responsible for business development at B.C.’s Carbon Engineering Ltd. He’s referring to the fact that the captured, compressed CO2 can be permanently sequestered underground, removing it completely from the atmosphere. Alternately, it can be used to produce materials such as plastics, industrial chemicals or utilized in the production of alternative fuels that are compatible with today’s engines, and can be blended with traditional fossil fuels to create progressive emission reductions. Carbon Engineering is working to commercialize two clean energy technologies, one called Direct Air Capture (DAC), an industrial scalable technology which removes CO2 directly from the atmosphere and can contribute to reducing the effects of global climate change by enabling large-scale use and storage of atmospheric CO2. The second technology is Air To Fuels which reduces the carbon footprint by producing synthetic transportation fuels – gasoline, diesel or jet fuel – using only the atmospheric CO2 and hydrogen split from water. Holmes notes that DAC plants can be scaled up to capture one million tonnes of CO2 per year, roughly the equivalent of the annual emissions of 250,000 average cars. This is an engineering breakthrough on two fronts: A potentially cost-effective way to take CO2 out of the atmosphere to fight climate change and a potentially cost-competitive way to make gasoline, diesel, or jet fuel that doesn’t add any additional CO2 to the atmosphere. Carbon Engineering’s pilot plant has been running since 2015, capturing about one tonne of CO2 per day. The process works by sucking air into a modified cooling tower with fans, where it comes into contact with a liquid that reacts with the CO2. After several processing steps, a pure stream of CO2 is extracted. In 2018, Carbon Engineering published peer-reviewed research that proved CO2 can be captured from the atmosphere using its DAC technology for less than US$100 per tonne. This paper demonstrated for the first time that DAC is a scalable and cost-effective solution for removing CO2 from the air. The research was published by Joule, a leading scientific journal dedicated to ground-breaking energy research, and the findings were based on three years’ operations and research from the company’s pilot plant. The next step is to have a number of scaled-up plants producing hundreds of thousands of barrels of carbon-free fuel, to drive down costs further, much as solar and wind energy costs have plummeted over the past decades as scale has risen. As prices fall, more governments may get on board with the idea of pulling CO2 out of the air. Carbon Engineering is building a larger plant, utilizing low-cost renewable energy that will produce 200 barrels of synthetic fuel a day. It should be operational in 2021, to be followed by construction of a commercial plant that can produce 2,000 barrels per day. Carbon Engineering’s design blows air through towers that contain a solution of potassium hydroxide, which reacts with CO2 to form potassium carbonate. The result, after further processing, is a calcium carbonate pellet that can be heated to release the carbon dioxide. That CO2 could then be pressurized, put into a pipeline and disposed of underground, but the company is planning instead to use the gas to make synthetic, low-carbon fuels, which the company says it can produce at a cost of about $1 per litre. In a June 2018 article in National Geographic, David Keith, a Harvard Professor of Applied Physics and founder of Carbon Engineering said capturing CO2 from the air and making fuel didn’t require scientific breakthroughs per se as much as $30 million, eight years of engineering, and a “million little details” to get the process right. “This isn’t going to save the world from the impacts of climate change, but it’s going to be a big step on the path to a low-carbon economy.” Getting it right also meant keeping the costs below $100 for each tonne of CO2 removed from the atmosphere. Until now, the cost of CO2 removal, or “direct air capture,” was believed to be at least $600 per tonne, a price far too high to be useful in removing large amounts of CO2 out of the atmosphere. Every year the world burns enough fossil fuels to add close to 40 billion tonnes of CO2. However, keeping global warming to less than two degrees Centigrade (the international target to avoid the most dangerous impacts) will likely require “negative emissions”—some way of taking high volumes of CO2 out of the atmosphere and storing it permanently, according to the Intergovernmental Panel on Climate Change. Or, as in the case with Carbon Engineering, synthesize the CO2 into clean, affordable transportation fuels. Technological “fixes” to the carbon emissions driving climate change have always been regarded with suspicion by scientists. Plans to build solar shields in space or to seed the seas with materials to soak up carbon are likely little more than dangerous distractions to the more mundane but difficult task of getting people to cut their emissions. However, plans to capture CO2 directly from the air have been regarded as somewhat more substantial – essentially mirroring the actions of trees. The idea was first developed by a scientist called Klaus Lackner in the mid-1990s and since then a small number of technology companies have built expensive prototypes of carbon removing devices. In 2017, a Swiss company called Climeworks unveiled a direct air capture installation that extracted carbon and supplied it to a neighbouring greenhouse to fertilize tomatoes and cucumbers. Carbon Engineering’s CEO, Steve Oldham, welcomed BHP’s investment. “At CE we’re focused on commercialization of technologies that can play a critical role in addressing climate change. As we work to deploy our technologies at large scale around the world, we’re thrilled to welcome investment from industry-leading companies like BHP.” In the release, Mr. Oldham is further quoted, saying, “BHP’s global reach and experience in executing complex projects, as well as its strategic commitment to reducing emissions, makes it an ideal partner to help us accelerate the commercialization and use of CE’s technologies. We’re looking forward to working with BHP and our other partners as we progress the development of DAC and Air To Fuels™ facilities, and ultimately achieve our goal of delivering affordable, carbon-neutral fuels and significant emissions reductions around the globe,” said Mr. Oldham. Carbon Engineering Ltd. is privately owned and is funded by investment or commitments from private investors and government agencies. CE’s private investors include Bill Gates, Murray Edwards, Oxy Low Carbon Ventures, LLC, Chevron Technology Ventures and BHP.